The general store was dominated and pushed out by the competition of a more modernized version of itself, the convenience store. As with all advances in technology, the social ramifications can be serious. The general store was not only a retail outlet, it served to support the local community not just in economic fashion but as a center of social interaction and identity. The modern convenience store, often a chain store or franchise, offers convenience over identity, and little opportunity for socializing. Instead, it supports the hectic lifestyle in which men and women both work, often more than one job, and thus need to buy essential items at a convenient location at any time of the day or night. Although such a situation may seem imperfect, the adaptation of the general store to convenience store serves a valuable function in supporting these individuals. In a more ideal form of society, the convenience store would have to adapt further to maintain its supporting role. 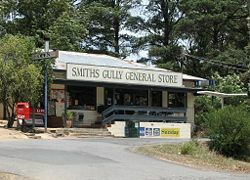 General stores are small stores known for their variety of goods and services. The concept of the general store can be traced back to trading posts, which were located on trade routes. Beyond trading and bartering goods and supplies, trading posts were also places for people to meet and exchange the "news of the world" or simply the news from their home country (many of the world’s trading posts were places to which people loved to emigrate) in a time when even newspapers did not exist. Many important cities started their history as trading posts, including Venice, New York, Shanghai, Singapore, Hong Kong, Naples, and Rotterdam. In the United States in the early nineteenth century, trading posts used by Native Americans were licensed by the federal government. Tribes were forced to concede substantial territory to the United States in order to access them, such as what happened at Fort Clark in the Treaty of Fort Clark in which the Osage Nation conceded most of Missouri in order to access the trading post. Trading posts were also very common in the early settlements of Canada and the United States for the trade of such things as fur. They continue to be used in many summer camps across America as places to buy snacks, essential items, and souvenirs. As people settled in the areas along trade routs, general stores developed as more established versions of the trading posts. At the height of their popularity, general stores that were owned and operated by individuals or partners quickly followed peddlers into newly occupied regions. To survive in such limited markets, storekeepers sold great varieties of merchandise to customers, marketed crops taken in trade, operated local post offices, and provided credit and elementary banking services. Many turned to banking, manufacturing, processing farm crops, or other specialized business services. General stores thus met an economic need at a vital stage of community development, and they also served as training schools for people who would ultimately concentrate on more specialized commercial enterprises. General stores adapt to serve the needs of their customers. Those remaining today, for example, often sell staple food items such as milk and bread along with various household goods such as hardware and electrical supplies. 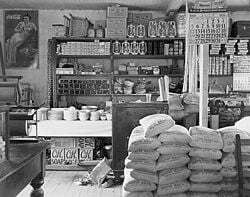 Historically, general stores provided small communities with basic essentials allowing rural areas with little outside contact to maintain their solidarity and save on the expense of traveling to a far off area to buy necessary products. In the United Kingdom, similar retailers tend to be called a village shop in rural areas or a corner shop in urban or suburban settings. Due to urbanization, the influx of suburban community development, and the relatively recent phenomenon of "big-box" chain stores and discount stores there are far fewer general stores in operation than there once were. During the first half of the twentieth century, general stores were displaced in many areas by many different types of specialized retailers. But from the 1960s through the 1990s, many small specialized retailers were in turn crushed by the so-called "category killers," which are "big-box" wholesale-type retailers large enough to carry the majority of best-selling goods in a specific category like sporting goods or office supplies. The convenience inherent in the general store has been revived in the form of the modern convenience store, which can be seen as taking the general store concept to its largest possible implementation. 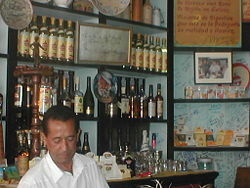 Bartender at the famous La Bodeguita del Medio in Havana, Cuba. Hanging on the bar is a plate with a likeness of Ernest Hemingway and a framed, signed message written by him. He was a regular patron. Bodeguita comes from the Spanish language meaning "small store" or "small warehouse." Traditionally, bodeguita existed selling general merchandise, then they were replaced slowly by the chain store, the same way large chains have practically eliminated the "mom and pop" store in the U.S. The bodeguita existed primarily in Latin America; in many small towns, they still exist like smaller versions of a general store. In the United States, some bars and restaurants that mainly serve Cuban food are modeled on the famous bar, "La Bodeguita del Medio" in Cuba. An internet "bodeguita" offers hard to find products from Latin America in the United States. A convenience store, sometimes abbreviated to c-store, is a small store or shop, usually located alongside busy roads, or at gas/petrol stations. They are also frequently located in densely-populated urban neighborhoods. They can take the form of gas stations supplementing their income with retail outlets, or convenience stores adding gas to the list of goods that they offer. Airports and railway stations also often have convenience stores. With the rise of urbanization and franchising, general stores were losing their place. Convenience stores met many of the same needs as general stores but did it more effectively and with more choices. With an increase in automobile ownership, people were willing to travel further, and more people would make their way to drive-up grocery stores or to convenience stores that were situated at the gasoline station. General stores were not accustomed to large customer flows, but convenience stores gladly accepted more traffic. Various types of convenience store exist, for example: liquor stores, mini-markets (mini-marts), or party stores. Typically junk food (candy, ice cream, soft drinks), lottery tickets, newspapers, and magazines are sold. Unless the outlet is a liquor store, the range of alcoholic beverages is likely to be limited (to beer and wine) or non-existent. Many stores carry cigarettes and other tobacco products. A variety of types of food supplies are usually available, from household products, to prepackaged foods like sandwiches and frozen items. Automobile related items such as motor oil, maps and car kits may be sold. Often toiletries and other hygiene products are stocked, as well as pantyhose and contraceptives. Some stores also offer money orders and wire transfer services. Some convenience stores offer prepared food service, with items such as chicken pieces, breakfast sandwiches, and many other food items. Often there is an in-store bakery—throughout Europe these now sell fresh French bread (or similar). A process of freezing part-baked bread allows easy shipment (often from France) and baking in-store. A delicatessen counter is also popular, offering custom-made sandwiches and baguettes. Some stores have a self-service microwave oven for heating purchased food. Racks offering fresh delivered doughnuts from local doughnut shops are common. Increasingly, fast food chains are placing food service counters inside convenience stores and offering a limited menu of items that are not cooked at the store but instead are delivered several times a day from a local branch of the restaurant. Convenience stores may be combined with other services, such as a train station ticket counter or a post office counter. Prices in a convenience store are typically higher than at a supermarket, mass merchandise store, or auto supply store (with the exception of such items as milk, soda, and fuel that convenience stores sometimes use as loss leaders and in which they traditionally do high volume). Although larger, newer convenience stores have quite a broad range of items, the selection is still limited compared to supermarkets, and in many stores only one or two choices are available. Convenience stores may have long shopping hours, some being open 24 hours. The first chain convenience store in the United States was opened in Dallas, Texas in 1927 by the Southland Ice Company. This eventually became the nationwide 7-Eleven chain. Since that time many different convenience store brands have developed, and their stores may either be corporate-owned or franchises. The items offered for sale tend to be similar despite store brand, and almost always include milk, bread, soft drinks, cigarettes, coffee, candy bars, hot dogs, ice cream, pretzels, popcorn, beef jerky, maps, magazines, newspapers, small toys, car supplies, feminine hygiene products, and toiletries. Nearly all convenience stores also have an automated teller machine (ATM), though other banking services are usually not available. State lottery tickets are also available at these stores. Some convenience stores in the United States also sell gasoline. The stores will sometimes be the only stores and services near an interstate highway exit where drivers can buy any kind of food or drink for miles. Policies regarding the sale of adult magazines vary, but generally larger chains (such as 7-Eleven and Casey's General Stores) do not sell these items, while smaller independent stores may do so. Because the laws regarding the sale of alcoholic beverages vary from state to state in the United States, the availability of beer, wine, and liquor varies greatly. For example, while convenience stores in Alaska, Pennsylvania, and New Jersey cannot sell any kind of alcohol at all, stores in Nevada and California may sell alcoholic beverages of any sort, while stores in Virginia, Washington, or Oregon can sell beer and wine, but not liquor. American convenience stores are many times the target of armed robbery. In some areas of the United States, it is not uncommon for clerks to work behind a bulletproof glass window, even during daylight hours. The main dangers are that almost all convenience stores have only one person working the night shift, most of the transactions are in cash, and easily resold merchandise, such as liquor, lottery tickets and cigarettes are on the premises. Most convenience stores have a cash drop slot into a time-delay safe so clerks may limit the amount of cash on hand. Many have installed security cameras to help prevent robberies and shoplifting. Convenience stores have also expanded in Canada. 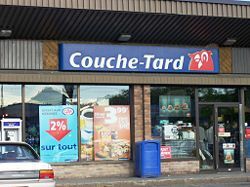 Alimentation Couche-Tard Inc., which operates Mac's Convenience Stores and Beckers Milk, is the largest convenience store chain in Canada. Another large chain is Quickie Mart. The world's largest convenience retailer, 7-Eleven, has about five hundred locations in Canada extending from British Columbia to Ontario. Marketing itself as "more than just a convenience store," there are over 150 Hasty Market locations throughout Ontario. Convenience stores are also commonly referred to as "corner stores" or "variety stores" in some regions of Canada. In the mostly French-speaking province of Quebec, a convenience store is known as a "dépanneur," or "dep" for short. "Dépanneur" comes from the verb Dépanner which means "to help out of difficulty," reflecting the role of such stores in providing essential items at convenient locations often round the clock. Although originating in the United States, convenience stores developed tremendously in Japan. 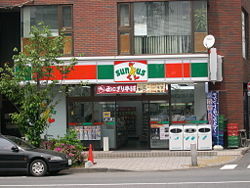 Japanese-styled convenience stores called konbini also heavily influenced those stores in other Asian nations, such as Taiwan, Thailand, South Korea, and China. In many cases, several same-chained stores exist in neighboring areas. This strategy, called dominant, makes distribution to each store cheaper. It also makes multiple distributions per a day possible. Generally, foods are delivered two to five times a day from factories to each store. Since products are delivered as needed, stores do not need large stock areas. As of 2005, there were over 43,000 convenience stores in Japan. 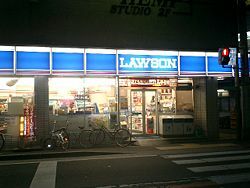 Among them, 7-Eleven led the market with over 11,000 stores, followed by Lawson and FamilyMart. Convenience stores in Japan are similar to those in the rest of the world with the addition of a few items, including rice and noodle meals, and the ability to pay for utilities and insurance at convenience store counters. Also, there are no lottery tickets or gasoline available in Japanese convenience stores, in contrast with most other countries. Taiwan boasts over eight thousand convenience stores. It has the Asia Pacific’s and perhaps the world’s highest density of convenience stores per person. With close to four thousand 7-Eleven stores, Taiwan also has one of the world’s highest density of 7-Elevens per person. In Taipei, it is not unusual to see two 7-Elevens across the street or several of them within a few hundreds of meters of each other. Because they are found everywhere, convenience stores in Taiwan provide services on behalf of financial institutions or government agencies such as collection of the city parking fee, utility bills, traffic violation fines, and credit card payments. It is estimated that 80 percent of urban household shoppers in Taiwan visit a convenience store each week. Major convenience stores in Singapore are 7-Eleven (owned by Dairy Farm International Holdings) and Cheers (owned by NTUC Fairprice). 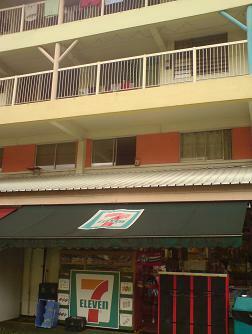 7-Eleven began the trend of convenience stores in Singapore when it opened its first store in 1982 by Jardine Matheson Group, under a franchise agreement with Southland Corporation of the United States. Dairy Farm International Holdings acquired the chain from Jardine Matheson Group in 1989. Other convenience stores such as Myshop and One Plus appeared in 1983. Figures from the Singapore Department of Statistics showed that there were 338 7-Eleven stores and 91 Cheers outlets in 2004. Myshop belongs to a Japanese company and One Plus belongs to Emporium Holdings. 7-Eleven stores are open twenty-four hours, seven days a week, including Sundays and public holidays. 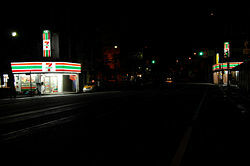 This 24-hour policy is seen as a major factor giving 7-Eleven an edge over its competitors. Various reasons unique to Singapore have been given for the great popularity of convenience stores there. Convenience stores sell a wide range of imported goods, whereas minimarts and provision shops sell local products with a limited range of non-Asian products. Convenience stores are situated within housing estates thus reducing consumer traveling time. Most families in Singapore are dual-income. Since both the husband and wife are working, there is greater need for convenience in shopping for daily necessities. The 24-hour opening policy allows convenience stores to reach out to a larger group of consumers. Firstly, the policy caters to the shopping needs of consumers who work shifts or have irregular working hours. Secondly, the policy caters to the increasing number of Singaporeans who are keeping late nights, reported to be 54 percent staying up past midnight in an economic review by Price Waterhouse Coopers (PWC) in 2005. ↑ 1.0 1.1 Lewis Atherton, The Frontier Merchant in Mid-America (University of Missouri Press, 1971, ISBN 978-0826205308). ↑ R. B. Fleming, General Stores of Canada (Lynx Images, Inc., 2002, ISBN 978-1894073295). ↑ 3.0 3.1 3.2 A Short History of the Convenience Store Industry, National Association of Convenience Stores (2007). Retrieved August 3, 2007. ↑ Bodeguita.com. Retrieved August 3, 2007. ↑ History of Convenience Store Linked to American Mobility. National Petroleum News (1990). Retrieved August 3, 2007. ↑ “What Are The Most Important Linguistic Boundaries In Canada, In Terms Of Daily Vocabulary?” North American Regional Vocabulary Survey (2002). Retrieved July 3, 2007. ↑ 7.0 7.1 7.2 “From Beijing to Budapest: Winning Brands, Winning Formats,” Price Waterhouse Coopers (2006). Retrieved July 3, 2007. ↑ Dairy Farm South Asia Achieves Double Digit Growth. Dairy Farm South Asia (2005). Retrieved July 11, 2007. ↑ June Cheong, “Upstart Mini-marts.” The Sunday Times, Asiaone Business (2006). Retrieved July 3, 2007. ↑ David Ghitelman, “Rush to Retail.” Supermarket News (2001). Retrieved July 11, 2007. Atherton, Lewis. 1971. The Frontier Merchant in Mid-America. University of Missouri Press. ISBN 978-0826205308.